The artwork for this release leads the listener to expect a tango album of some sort, which this set of contemporary compositions for alto saxophone and piano or electronic accompaniment mostly is not. The only actual tango on hand is Astor Piazzolla's gloriously elegiac Adiós Nonino, in an arrangement by saxophonist Todd Oxford, and indeed it does work beautifully on the saxophone, which has the same combination of passion and grit as Piazzolla's bandoneón. Instead, Oxford offers something rarer than a tango album: a program that circles loosely around the ideas of the tango, dance, Latin America, nightlife, and the meeting of classical and vernacular traditions. The opening Tango Magnetism of Daniel Gutwein hints of the tango as "a metaphor for other male-female relationships in which passions are contained not only by the conventions and formal restraints of society, but by their own fears of chaos," put it that way and the music's rather abstract patterns make sense. John Williams' Catch Me If You Can comes from the film of the same name. The prolific David Amram combines a jazz-tinged ballad with a piece influenced by the Taxim genre of Arabic music, while Aaron I. Bramwell's Canciones del Zócalo (Songs of the Plaza) nicely evokes a Latin American town with very few gestures. David Heuser's electronic Deep Blue Spiral is consistent in mood with the rest of the music, but nonetheless seems to break the thread of consistently related music. Nonetheless, this is a model contemporary instrumental recital, one that directly appeals to an audience and finds a secure place for concert music within its everyday surroundings without recourse to sentimentality or familiarity. This is the second solo CD by Todd Oxford, and comprises six pieces for alto saxophone and either piano or tapes electronics, most of which are new contemporary works. The title had led me to expect a programme of tango music, but that proved not to be the case, although the recording begins and ends with a tango. The title track by Dan Gutwein used a tape soundtrack of synthesized instrumental samples and other sounds. The music ranges from gentle to dramatic to violent, exploring both the restrained and passionate aspects of tango. Todd Oxford produces a soulful classical alto sound, with strong vibrato and a lovely tone in the low register. The arrangement of John Williams’s film track Catch Me if You Can is a jazzy, spirited game of tag between the piano and saxophone in a contrasting, light hearted mood. David Amram’s Ode to Lord Buckley is a saxophone concerto of two contrasting movements, composed in memory of the American entertainer. The first is a slow ‘Ballade’, a duet with a folk music inspired pastoral theme and a contrasting jazzy section at its centre. The second, ‘Taxim’, has a Middle Eastern flavour, based around an Arabic scale with an improvisatory feel in parts. The saxophone lends itself well to the music with its trilled embellishments and flamboyant, swooping phrases. Canciones Del Zocalo continues in the same vein with a South American feel, Latin rhythms and solo episodes for each instrument. For me, the highlight is David Heuser’s Deep Blue Spiral for saxophone and tape. This imaginative and well-constructed piece updates the classical saxophone tradition with multiphonics and rhythmic use of electronic sound samples to great expressive effect. The final interpretation is Piazzolla’s beautiful Adios Nonino. Recently I was made aware of an impressive recording by saxophonist Todd Oxford. Oxford is perhaps best known as the co-founder of the Elision Saxophone Quartet as well as a member of the Harvey Pittel Saxophone Quartet. His extensive recital and performance credits include tours throughout most of the United State and across the globe. He has been featured in Saxophone Journal and recently offered his own line of saxophones. 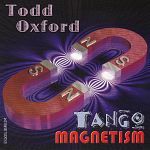 Tango Magnetism by Todd Oxford and pianist Daniel Immel features seven varied pieces for alto saxophone. The demanding literature showcases Oxford’s formidable classical saxophone talents throughout the range of the instrument. Classical saxophone aficionados as well as those who enjoy more exploratory works will not be disappointed by this release. The John Williams piece Catch Me If You Can originally performed by Dan Higgins is a personal favorite. One can appreciate the chemistry between saxophonist Oxford and accompanist Immel as they honor the spirit of this piece set for full orchestra. The remaining five contemporary selections on Tango Magnetism offer much bright window into Oxford’s talents on the saxophone. The altissimo, vibrato and intonation are all that you would expect from such a highly trained saxophonist as Todd Oxford. This CD Tango Magnetism is a magnificent example of literature being composed today for the saxophone. And on this CD saxophone artist Todd Oxford leads the way artistically through exciting new material. Todd Oxford has toured the world performing, including such places as Europe, Asia, Mexico, Canada, and forty-six of the fifty United States. He has served as a saxophone design consultant for two Chinese instrument makers, which released saxophones bearing his name. He received the Doctor of Musical Arts in 2001 from the University of Texas. While an undergraduate student he received an invitation to join the well-known Harvey Pittel Saxophone Quartet, where he spent thirteen years as their baritone sax player, which included extensive touriung with the group. The quartet has performed in hundreds of venues, radio and television shows, orchestral pops series, and has been the featured group with many wind ensembles. Then in 1990 he co-founded the ELISION Saxophone Quartet and is their soprano saxophonist. He is currently on the faculty at Texas State University School of Music. 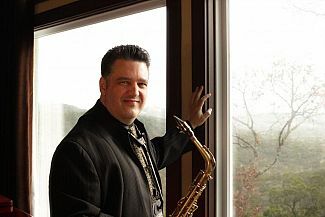 Todd Oxford has a warm rich sound on alto saxophone and he uses an imapssioned vibrato the beautifully enhances his saxophone sound. This is very apparent on the first selection, titled Tango Magnetism by Daniel Gutwein. Tango is a fantastic composition for alto and prepared tape. The opening is extremely powerful and moving. The tape accomopaniment is an added phenomenal sound experience. It starts with electronic clicking, then the music slowly enters and slowly builds and builds. The saxophone ultimately enters in a subdued manner with a beautiful melody. Everything continues to build with Todd’s alto saxophone leading the way. It takes an accomplished saxophonist to keep up with this accompaniment, which Todd shows himself to be utilizing very demanding subtle nuances in the music that only a true artist can bring out. The second selection is Catch Me if You Can, by John Williams. Todd Oxford is joined by pianist Daniel Immel who is an Assistant Professor of Music and Head of Piano Studies and Music History at Louisiana Tech University. Todd Oxford and Daniel Immel form an incredibly intuitive duo. Catch Me if You Can opens with the piano and unfolds into a delightful romp with moments of surreptitious stealth. The next selection is Ode to Lord Buckley, by David Amram. The first movement, titled Ballade, is a stark and open piano solo that is lovely, even though it toys with your heart strings. The piano takes a mini solo answered by the alto saxophone. They continue to exchange sound thoughts in a reminiscent manner, then the alto resorts to jazz lines. The duo resumes to more somber attitude at the end. The second movement, Taxim, has a lively character with a strong Arabic flavor. The two players trade ideas back and forth but at the conclusion they return the mood of the opening Ballade movement. The very end recaptures the Taxim theme. The next selection is Canciones Del Zocalo, by Aaron I Bramwell. This piece is a programmatic piece written in 1998. It follows a young woman on a trip through her native village. As she walks from place to place she is surrounded with different upbeat Latin rhythms from her village’s plaza where music, culture, and traditional are a staple of everyday life. Instead of being a solo with accompaniment it is essentially two solos being played simultaneousnly that fit nicely together. Fasten your seat belts for Deep Blue Spiral, by David Heuser. It is another prepared tape accompaniment with an alto saxophone soloist that sounds like an underscore for a science fiction epic fantasy. The excitement is maintained at a fever pitch from beginning to end. Todd Oxford plays this piece to the hilt. This is truly a fascinating musical adventure that is excitement personified. The CD has a touching conclusion with a composition entitled Adios Noninio, by Astor Piazzolla. Adios Nonino is Piazzolla’s farewell following the death of his father. This piece was arranged for saxophone and piano by Todd Oxford. Todd Oxford has given to us a thoroughly enjoyable CD and opened our ears to some new and exciting sounds. On this CD Todd Oxford and Daniel Immel have played with our emotions in a wonderfully artistic manner. Do not miss this CD. It is a real keeper.